Hey everyone! 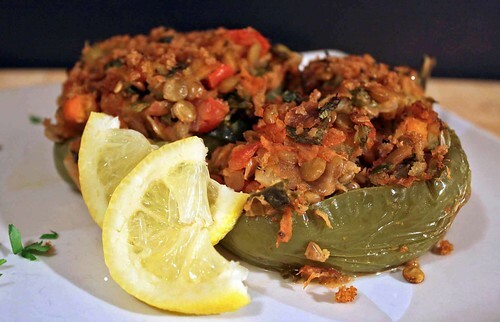 I’ve been meaning to put up this recipe for Lentil Stuffed Peppers for a while now but just never got to it. I made this about a week ago when I add some peppers to use up. I am always looking for new ideas for stuffed peppers. 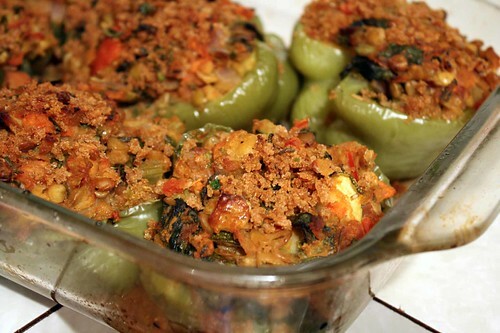 As I was thinking of various things I could do with these peppers I came up with an idea of stuffing them with lentils! I chose to go with a Mediterranean inspriation for these peppers. I really enjoy the flavors of the Mediterranean and these peppers feel very Mediterranean with all the lemon in them! I really like lemon, I just can’t get enough of it and it really brings these peppers to the next level! This recipe is a great nutritious way to use lentils. The ingredients you can put into these stuffed peppers are endless. I chose vegetables that I had on hand that day but you can certainly use any vegetable you like or have on hand. I also added a panko topping to these peppers, I just think it adds something special to them. Serve these peppers as a main course with a salad and some toasted bread or as a side dish! In a saucepan add the lentils and about 2 cups of water and bring to a boil. When it is boiling bring the heat down to a simmer. Simmer the lentils for 15 minutes, you don’t want them to go mushy so keep an eye on them. They should still retain their shape. After 15 minutes, drain the lentils and set them aside. Meanwhile, cut 4 bell peppers in half, take the seeds out but leave the stem intact. Bring a pot of water to a boil. After the water is up to a boil, drop the peppers in the water and blanch them for 3-5 minutes. Immediately add them to a bowl of ice water. Now time for the filling! Heat a skillet over medium heat with two tablespoons of olive oil. Add the onions, carrots and celery and saute for 5 minutes. Add the garlic and saute until fragrant. Now, add the zucchini or any other vegetable you are using. Saute the zucchini for about 2 minutes. Now add the tomatoes, vegetable broth, and herbs. At this time season with salt and pepper. Cook the mixture for a few minutes. Now add the spinach and cook until wilted. Add the lentils and cook for another 2 minutes. Add the parsley and lemon juice. Re-season if necessary. Lightly oil a casserole dish. Place the peppers in the casserole dish. Now stuff them with the lentil mixture genoursly. Cover them with tin foil and bake them for 25-30 minutes. After 25-30 minutes take the tin foil out and sprinkle the peppers with the topping. Bake uncovered for another 15 minutes until the top is golden brown. That’s it! Let cool for a couple of minutes and serve with plenty of lemon slices! Heat a small pan over medium heat with 1 tablespoon of olive oil. Add the panko bread crumbs and thyme, cook for a few minutes until the panko bread crumbs are well coated. Now add the lemon zest and parsley, Season with salt and pepper. That’s it! Hello everyone! This past weekend I made some seitan which turned out delicious! I used the seitan recipe in Vegan with a Vengeance with a few modifications. I was looking to make a stringy seitan and I attempted to do that by kneading the seitan dough and then I stretched it and repeated with the kneading for about 5 minutes. I think the stretching made a great difference in the texture of the seitan. I really enjoyed the texture of this seitan and I will try to continue to experiment with the texture. Moving on to the recipe! My grandparents were preparing to cook some stewed green beans with beef. I asked my grandpa if he needed all the green beans and he said no, so I took about two cups of the green beans. I really wanted them to make the dish with seitan but they were not fully convinced. They have both tried seitan a few times but are still not convinced to use it in their dishes yet. They always laugh at me when I tell them I am making “meat” from flour! I keep explaning to them that it’s so pure and simple it’s just wheat gluten, a couple of spices, broth and that’s it. I really want to get them to eat seitan instead of meat but that were probably take so long as they don’t like to explore many different foods. Anyway I decided to make a delicous vegan adaption of their dish they were making! I really enjoy stewed green beans and I have blogged about them before. This time I decided I wanted to step it up a notch and add some seitan! Stewed Green Beans is a very popular Albanian dish that my mom would make all the time when she cooked, she usually made it with smoked meat. That is where I got the idea to flavor my seitan with some liquid smoke and smoked salt for a delicious smokey taste. The smokey seitan really give the recipe some kick! I like adding potatoes to my stewed green beans which I learned from my grandma. As the potatoes cook they thicken the sauce really good. I really enjoyed the taste of this stew! This Stewed Green Bean recipe is a great flavorful way to use green beans! The recipe makes enough for two hungry people, so if you have more people at home double the recipe. The recipe uses three tablespoons of olive oil so if you want to make this lower fat feel free to reduce some of the oil. I use smoked salt in this recipe which is very tasty and perfect for creating a smokey flavor in addition to the liquid smoke. Heat a medium pot over medium heat with 1 tablespoon of olive oil. When hot enough, add the seitan and saute until golden on all sides about 4-5 minutes. Towards the end at the liquid smoke and Smoked Salt. Remove from pot and set aside. Now add about 2-3 tablespoons of Olive Oil to the pot. Add the onions and saute for a good 8 minutes until they are translucent and tender. If your pot has burned pieces from the seitan, deglaze it with a bit of vegetable broth. Add the garlic and saute for a minute until fragrant. Now it’s time to add the green beans and potatoes. Saute the green beans and potatoes for about 5 minutes. Now add the tomato, paprika, oregano, chili flakes and season with salt and pepper. Saute for another two minutes. Add the vegetable broth or water and bring to a boil and then to a simmer. After a couple of minutes add the seitan that you have set aside. Simmer the stew for about 45-50 minutes until the green beans and potatoes are tender. If the stew starts to get dry simply add some more broth. Re-season with salt and pepper to taste if necessary. Remember to not go heavy on the salt because the Smokey Seitan is salt already from the smoked salt. Let the stew sit for 15 minutes or you can eat it has soon has it finished cooking. 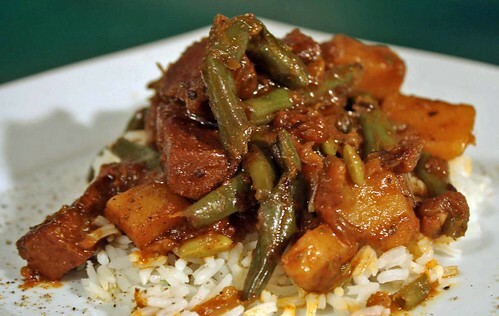 I like to serve these stewed green beans with some rice, bread, and a side salad or vegetable.